The annual Hacienda Heights Fourth of July parade begins at 9 a.m. and runs along Stimson Avenue, beginning near Colima Road and ending at Steinmetz Park. The parade is sponsored by the Kiwanis Club of Hacienda Heights and organized by an all-volunteer committee of Kiwanis members and community volunteers. The parade, which began in 1988, includes bands, floats, equestrian units, drill teams, church and school groups and several dignitaries. Entries come from many neighboring communities. The parade also features a Fourth of July Queen and her court. This year’s Miss Fourth of July is Leslie Alvarado. She will ride down the parade route with her court Jennifer Ly and Elizabeth Choong. The parade grand marshal is Dickie Simmons, field deputy for Los Angeles County Fourth District Supervisor Don Knabe. Simmons serves Hacienda Heights, Rowland Heights, Diamond Bar and La Habra Heights. Post-parade activities, which take place at Steinmetz Park, include special ceremonies and the awarding of trophies for the best parade entries. Local organizations host booths at this event. 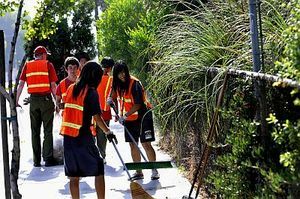 Read our story about the recent cleanup day at the Rowland Heights Highlander or Hacienda Heights Highlander. For further information, visit www.hhjuly4parade.org. Hundreds of Hacienda Heights residents turned out on over the weekend to get the Fourth of July parade route along Stimson Avenue and its nearby streets into tip-top condition for the coming holiday. Volunteers from civic groups and several local Boy Scouts troops turned out, as well as members of three major religious groups: St. John Vianney Catholic parish, the Church of Jesus Christ of Latter-Day Saints and Hsi Lai Temple. “I challenge you to find another place where you have Catholics, Mormons and Buddhists cooperating together, all in the same place,” said Jim Snyder of the Hacienda Heights Improvement Association, which sponsors the event. Held the Saturday before before the community’s “I Love America” parade, the Jim Davis Beautification Day has become a popular annual event over the past 15 years. It is named after a former president of the association. Time to vote! Registered voters in Rowland Unified School District (Rowland Heights and parts of Walnut, La Puente and West Covina) must postmark their Measure E Special Parcel Tax Election ballot by Thursday, June 25. The election is being conducted as an all vote by mail election. Ballots must be postmarked by tomorrow to be received by June 30. If voters are unable to mail their ballots in time, the Los Angeles County Registrar-Recorder/County Clerk established a special satellite ballot drop-off location for voters’ convenience in the lobby of the Rowland Heights Library at 1850 Nogales St. on Tuesday, June 30 from 7 a.m. to 8 p.m. The ballot drop-off location is exclusively for voters who did not mail their voted ballots in time. It will be staffed by registrar personnel. Voters who did not receive a Vote by Mail ballot, should call the RR/CC, Vote by Mail Unit at (562) 466-1323. Voters can verify if they live within the Rowland Unified School District on the RR/CC website: www.lavote.net by clicking the Voter & Election Information tab, then clicking on Locate My District link. Persons requiring multilingual assistance in Chinese, Japanese, Korean, Spanish , Tagalog/Filipino, or Vietnamese can call (800)481-8683. Rowland Unified School District is facing more than $13 million in cuts because of the state budget deficit. The district says this will have a devastating impact on every school as well as the educational programs. Measure E is a local parcel tax that would help raise an estimated $2.5 million annually for five years only. These funds could not be taken away by the state and would provide stable funds to be used to maintain college preparation classes and high school counselors. If approved, Measure E will cost property owners $10 per month, for a total of $120 per year, for five years only. Property owners age 65 and over can apply for an exemption. If passed, the deadline to fill out the senior exemption form is July 30. An independent Community Oversight Committee will be appointed by the school board to make sure that school parcel tax funds are properly spent. To pass, Measure E must receive at least 66.7% support from those who vote on the measure. For further information, please visit www.RowlandSchools.org or call (626) 854-8352. Celebrate the grand opening of the new IMAX theater at AMC Puente Hills 20 on Wednesday from 6 to 7:30 p.m. Residents can enter for a chance to win AMC, IMAX and “Transformers” prizes while supplies last. Moviegoers can also bring a new unwrapped toy valued from $5 to $10 for charity to win other prizes such as SpeedZone season passes and gift cards. The toys will be donated to the Industry Sheriff’s Station for distribution to needy families. The IMAX experience combines crystal-clear images with a customized audio system and bigger screen. Magicians Rafael and Katia will perform at 2 p.m. Thursday, June 25, at the Rowland Heights Library. Children will learn how books can magically help take us to new places, meet new people and learn to do anything. The library will also hold a book sale from 10 a.m. to 4 p.m. Saturday, June 20. Come out and join the 15th anniversary of the Jim Davis Beautification Day in Hacienda Heights on Saturday, June 27. The Hacienda Heights Improvement Association sponsors this event in which community members clean up the parade route of the Fourth of July parade down Stimson Avenue. Religious groups, civic clubs, scout troops and schools volunteer their time. Individuals and families also help out. The event is always the Saturday before the Fourth of July. Volunteers will meet 8 a.m. at the Church of Jesus Christ of Latter-day Saints on the corner of Colima Road and Dawnhaven Road. Participants must be 11 years of age or older. They should bring a broom, rake or square-nosed shovel. The County of Los Angeles Public Works Department provides gloves, safety vests and trash bags. The work is usually accomplished in about three hours. Several community businesses will provide water and refreshments. The Rowland Recreation Department will hold special Saturday registration today from 9 a.m. to 11 a.m.
Sports classes include basketball, tennis, soccer, martial arts and tiny tots sports. Dance classes include ballet, tap, jazz, hip hop, cheer & pom, musical production and Mexican dance. Music courses cover piano, guitar, drums and music for little ones! Arts offer drawing, cartooning, and art music, as well as arts and crafts. Computer classes will teach Microsoft Word, PowerPoint and typing.Science camps will include Mad Mad Robot Lab, Secret Agent Lab, Journey Into Outer Space and Science in Action. Children may also chose other classes such as ice skating, reading, etiquette, Chinese language and dog training. Each session will run from six to eight weeks. Register at the Rowland Adult and Community Education Recreation Department, 2100 Lerona Ave.
Office hours are 1 to 5 p.m. Monday through Thursday and 12:30 to 4:30 p.m. Friday. On Thursday, the Arcadia Teachers Association tentatively agreed to a 1.25 percent pay rollback, effective in the new school year. Superintendent Joel Shawn announced the news on a budget discussion blog entry. Board of Education President Joann Steinmeier said the move would allow the administration to rehire all the probationary and permanent teachers given lay-off notices in March. Shawn said, however, that some instructors may be reassigned to different schools. With the Rowland Unified School District facing a massive deficit, perhaps its time for their teachers to consider such an option to save as many positions as possible. Teens can learn how to make their own buttons at the Hacienda Heights Library at 3:30 p.m. on Tuesday, June 23. Tweens and teens sixth grade and up can make buttons to decorate bookbags, purses and hats. The library will present the free program, “KCCO Radio Musical Mystery Show” at 3 p.m. on Wednesday, June 24. Families will enjoy sound effects, commercial singers and actors chosen from the audience.